Mapping the Earth's magnetic field - to find oil, track storms or probe the planet's interior - typically requires expensive satellites. 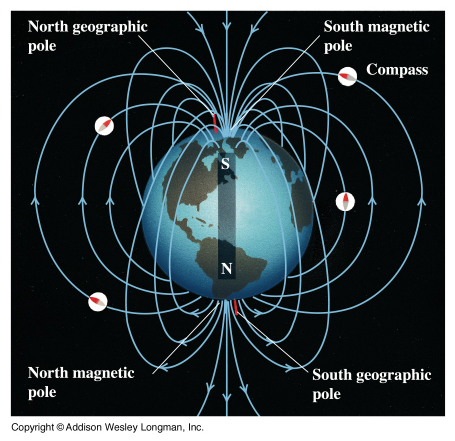 University of California, Berkeley, physicists have now come up with a much cheaper way to measure the Earth's magnetic field using only a ground-based laser. The method involves exciting sodium atoms in a layer 90 kilometers above the surface and measuring the light they give off. "Normally, the laser makes the sodium atom fluoresce," said Dmitry Budker, UC Berkeley professor of physics. "But if you modulate the laser light, when the modulation frequency matches the spin precession of the sodium atoms, the brightness of the spot changes." Various satellites, ranging from the Geostationary Operational Environmental Satellites, or GOES, to an upcoming European mission called SWARM, carry instruments to measure the Earth's magnetic field, providing data to companies searching for oil or minerals, climatologists tracking currents in the atmosphere and oceans, geophysicists studying the planet's interior and scientists tracking space weather. Ground-based measurements, however, can avoid several problems associated with satellites, Budker said. Because these spacecraft are moving at high speed, it's not always possible to tell whether a fluctuation in the magnetic field strength is real or a result of the spacecraft having moved to a new location. Also, metal and electronic instruments aboard the craft can affect magnetic field measurements. "A ground-based remote sensing system allows you to measure when and where you want and avoids problems of spatial and temporal dependence caused by satellite movement," he said. "Initially, this is going to be competitive with the best satellite measurements, but it could be improved drastically." The idea was sparked by a discussion Budker had with a colleague about of the lasers used by many modern telescopes to remove the twinkle from stars caused by atmospheric disturbance. That technique, called laser guide star adaptive optics, employs lasers to excite sodium atoms deposited in the upper atmosphere by meteorites. Once excited, the atoms fluoresce, emitting light that mimics a real star. Telescopes with such a laser guide star, including the Very Large Telescope in Chile and the Keck telescopes in Hawaii, adjust their "rubber mirrors" to cancel the laser guide star's jiggle, and thus remove the jiggle for all nearby stars. It is well known that these sodium atoms are affected by the Earth's magnetic field. Budker, who specializes in extremely precise magnetic-field measurements, realized that you could easily determine the local magnetic field by exciting the atoms with a pulsed or modulated laser of the type used in guide stars. The method is based on the fact that the electron spin of each sodium atom precesses like a top in the presence of a magnetic field. Hitting the atom with light pulses at just the right frequency will cause the electrons to flip, affecting the way the atoms interact with light. "It suddenly struck me that what we do in my lab with atomic magnetometers we can do with atoms freely floating in the sky," he said. Budker's former post-doctoral fellow James Higbie now an assistant professor of physics and astronomy at Bucknell University - conducted laboratory measurements and computer simulations confirming that the effects of a modulated laser could be detected from the ground by a small telescope. He was assisted by Simon M. Rochester, who received his Ph.D. in physics from UC Berkeley last year, and current post-doctoral fellow Brian Patton. 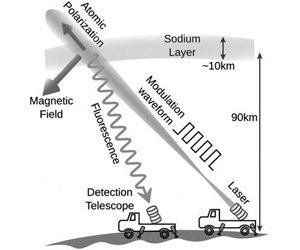 In practice, a 20- to 50-watt laser small enough to load on a truck or boat tuned to the orange sodium line (589 nanometer wavelength) would shine polarized light into the 10 kilometer-thick sodium layer in the mesosphere, which is about 90 kilometers overhead. The frequency with which the laser light is modulated or pulsed would be shifted slightly around this wavelength to stimulate a spin flip. The decrease or increase in brightness when the modulation is tuned to a "sweet spot" determined by the magnitude of the magnetic field could be as much as 10 percent of the typical fluorescence, Budker said. The spot itself would be too faint to see with the naked eye, but the brightness change could easily be measured by a small telescope. "This is such a simple idea, I thought somebody must have thought of it before," Budker said. "I was very, very happy to hear that, because I felt there may be a flaw in the idea, or that it had already been published," Budker said. Explains the 'blue spiral' light in Norway in Jan 2012. Electron microscopes are trying to add this spiral wave to clarify the magnification that has failed to live up to its potential; it appears the method of omitting the lenses for the e/m field will solve the problem but then we have to reexamine this successful interpretation of Einstein's 'gravity bends light' theory.